National Seeds Corporation invites online applications from eligible candidates for the post of MANAGEMENT TRAINEES, SENIOR TRAINEES / DIPLOMA TRAINEES, TRAINEES and TRAINEE MATE. National Seeds Corporation Limited under the administrative control of Ministry of Agriculture & Farmers Welfare, Department of Agriculture Cooperation & Farmers Welfare is an apex body engaged in production of quality seeds and distribution, invites online application from Indian Nationals for filling up the following posts on direct recruitment basis at Corporate Office (New Delhi), Regional Offices (at 10 different locations all over India) and Farms (located at Rajasthan, Haryana & Karnataka). Job Position: MANAGEMENT TRAINEES, SENIOR TRAINEES / DIPLOMA TRAINEES, TRAINEES and TRAINEE MATE. 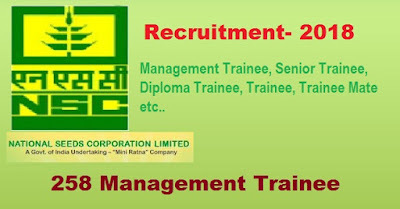 MANAGEMENT TRAINEES: Rs. 41360/- per month (Basic Pay Rs. 40000/- & DA Rs.1360/-) during training period plus HRA or single seated accommodation depending upon the place of posting. 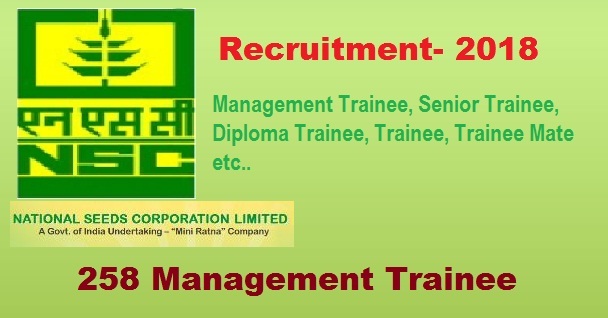 SENIOR TRAINEES / DIPLOMA TRAINEES: Rs. 22748/- per month (Basic Pay Rs. 22000/- & DA Rs.748/-) during training period plus HRA or single seated accommodation depending upon the place of posting. TRAINEES: Rs. 17578/- per month (Basic Pay Rs. 17000/- & DA Rs.578/-) during training period plus HRA or single seated accommodation depending upon the place of posting. TRAINEE MATE: f Rs. 17061/- per month (Basic Pay Rs. 16500/- & DA Rs.561/-) during training period plus HRA or single seated accommodation depending upon the place of posting. (processing fee) for SC/ST/PWD candidates through online or Net banking.